Tree-lined streets and neighborhood parks welcome residents and visitors to bicycling and pedestrian-friendly, downtown Traverse City. Traverse City has a vibrant downtown with a wide variety of shops, restaurants, galleries, and professional offices. Restaurants range from gourmet to food trucks and everything in between! The West Bay beaches- Clinch Park beach and West End beach- are great for swimming and paddling. Nearby vendors rent paddle boards and kayaks, as well as boats and jet skis. Clinch Park Marina is home to sailing and power yachts through the summer and a jumping off point for boating, sailing, and fishing in West Bay. Boardman River runs through downtown and is popular for paddling and fishing. The Boardman River connects West Bay to Boardman Lake where residents and tourists may be found sailing, paddling, fishing, and waterskiing. The Boardman Lake Trail is a paved, waterside walking trail along the lake. Lumber baron Victorian style homes, modest, 3-4 bedroom two-story, turn-of-the-century homes, new condos, and newly constructed homes with traditional architecture are scattered throughout downtown neighborhoods. 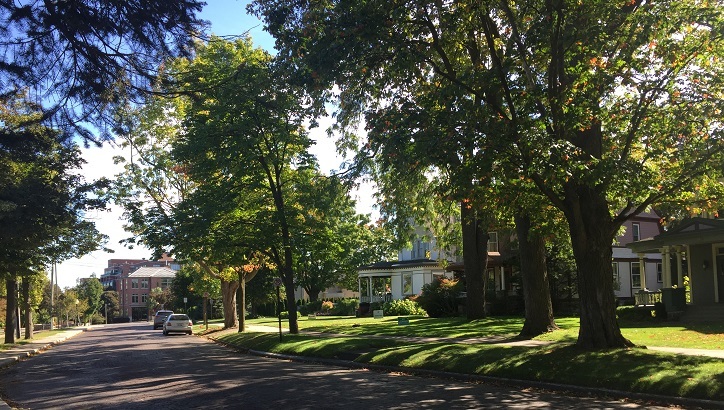 The Downtown Neighborhoods- Central, Slabtown, Boardman Lake, Oak Park, Old Towne, North Traverse Heights, and Midtown- each have their own character.